Point Blank at IMS College Malta: Full Schedule Announced! As previously announced, Point Blank and International Music Summit have partnered to create IMS College Malta, a new education initiative that will take place on the island from July 1st – 3rd. Now, with less than a month until it all kicks off, we are excited to reveal the names of the participants and the full two-day schedule of masterclasses, seminars, panels and interactive sessions. Point Blank will be hosting proceedings on Day One, and remember, PB students and graduates are eligible for a 35% discount. To claim the code, students and former students should get in touch with Point Blank with the name of their course. First up, on our side Point Blank will be bringing the musical expertise of lead course developer Ski Oakenfull. He will be hosting a special deconstruction masterclass in Ableton Live. In this session, Ski will break down the musical sounds and techniques used in a recent classic dance track – previously he’s broken down tracks from the likes of Kraftwerk, Moderat, Caribou, Disclosure and many more. Point Blank will also be hosting Ableton masterclass sessions with producer and Point Blank instructor Stefano Ritteri, who is best known for his releases on Defected, Exploited and Dirtybird, together with artist panels and masterclasses hosted by Point Blank’s own Declan McGlynn. The MO behind IMS College Malta is to educate and inspire the next generation of industry leaders. The comprehensive ‘Learn By Day’ programme features a carefully curated line-up that draws expertise, insights and perspectives from every strand of the music industry, from radio to running a label, promotion to talent buying. Heading up the roll call of industry names is BBC Radio 1’s Pete Tong, one of the most respected voices within dance culture. He will be sharing some of his invaluable knowledge gathered over decades at the very heart of the scene. Fast-rising artist/DJ duo Eli & Fur will be providing insight in how to break through as a new artist – surely an unmissable discussion for aspiring DJs and producers everywhere. Continuing the production theme, Joost Stuursma will be delving into the hot button topic of ghost production, and Chief Engineer of Red Bull Studios in Amsterdam, Frank De Jong will be covering music engineering. The programme will also be drilling down into the world of events with Croatia’s Hideout and Malta’s Lost & Found Festival director Wilf Gregory, former brand director and club booker of Pacha Ibiza and founder of IBZ Entertainment, Danny Whittle and Lucy Allen, Head of Festival & Events Press at Listen UP PR. Elsewhere, CR2 Records label boss Mark Brown will be sharing his insights into running a successful label (he’s released records by Eric Prydz, David Guetta and Nic Fanciulli), Mark Lawrence of The Assocation For Electronic Music and Robert Horsfall of Sound Advice LLP will be examining the impact of legal and music rights and lastly Laura Newton, who represents Róisín Murphy, Markus Schulz, Ferry Corsten, Chromeo, Little Dragon and Hercules & Love Affair, will be discussing the role of the music agent. The full programme is below. If you want to build a career within the music industry and become part of the next generation of industry professionals, our online Diploma courses will help you get there. Taken from anywhere in the world and for up to 64 weeks, they’re some of our most comprehensive courses. International Music Summit is an educational, inspirational and motivational thought leadership platform that was set up in 2007. It is dedicated to creating awareness of and appreciation for electronic music through the presentation of summits and events that celebrate the historic and ongoing contribution of the genre to art and culture worldwide. When you register with Point Blank, you access an array of free sounds, online course samples, access to our social network Plugged In and much more! Simply register below and visit our Free Stuff page to get your hands on a range of exclusive music-making tools and tutorials provided by the team. Fill your boots! The post Point Blank at IMS College Malta: Full Schedule Announced! appeared first on Point Blank’s Online Magazine. 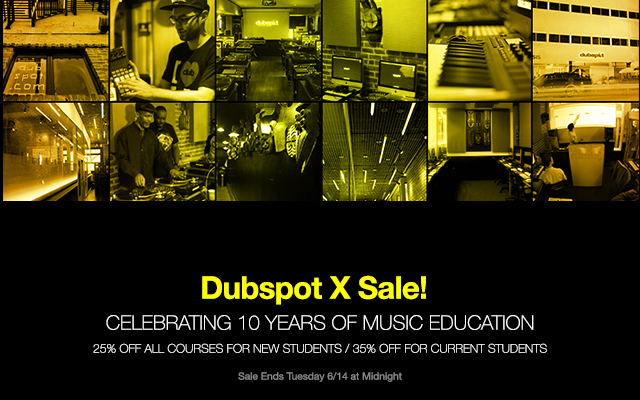 Dubspot X Sale: Celebrating 10 Years of Music Education in NYC, LA, and Online. Do More Than Just Listen! In celebration of our ten year anniversary, all Dubspot Courses are 25% off for new students, 35% off for returning students. Sale ends Tuesday, June 14th at midnight. Enroll Today! Do More Than Just Listen! Find your passion for creating music in our Music Foundations, Music Production, Mixing and Mastering, Sound Design, and DJ Programs. In celebration of our ten year anniversary, all Dubspot Courses are 25% off for new students, 35% off for returning students. Sale ends Tuesday, June 14th at midnight. Join the world’s leading learning environment and community of musicians, DJs, producers, visual artists, audio professionals, and enthusiasts of all music genres. As a Music School for both aspiring and experienced artists alike, Dubspot’s mission is to inspire and enable it’s students to achieve their creative goals. Classes are kept intimate, in one-of-a-kind, hands-on, lab environments and our talented tribe of musically diverse educators and artists focus on working with like-minded partners to bring the Dubspot Experience to the world! Contact Admissions today to learn more about our extensive course offerings and programs by calling 1.877.DUBSPOT. Find your Music Production or DJ Education at Dubspot and discover a learning experience that goes beyond software education. Our collection of carefully developed programs explore the core elements that inspire and shape the music you create. Whatever your interest, whatever your level of experience, we can help find the right class for you. Select a program that interests you to learn more about the curriculum and related courses. The post Dubspot X Sale: Celebrating 10 Years of Music Education in NYC, LA, and Online. appeared first on Dubspot Blog. Massive may have earned its stripes as a dubstep powerhouse, capable of complex modulations and integrate waveforms, but it’s a vastly versatile synth and in today’s FFL!, we’re going to show you why. PB Sound Design instructor Chris Carter takes a look at building drum sounds in Massive, from beefing up your existing samples to creating full-on analogue madness. We’ll then be loading the samples into NI’s drum plugin Battery for more tricks and treatment. Watch live at 1pm and make sure you subscribe to our channel so you never miss another FFL! If you want to learn more sound design, production, mixing, mastering and composition tips, our diploma course is perfect for you. Taken from anywhere in the world for up to 64 weeks, it’s one of our most comprehensive courses and has been taken by the likes of Claude Von Stroke, Plastician and Jon Rundell. Find out more here. The post Synth Drum Sound Design in Massive & Battery (FFL!) appeared first on Point Blank’s Online Magazine. 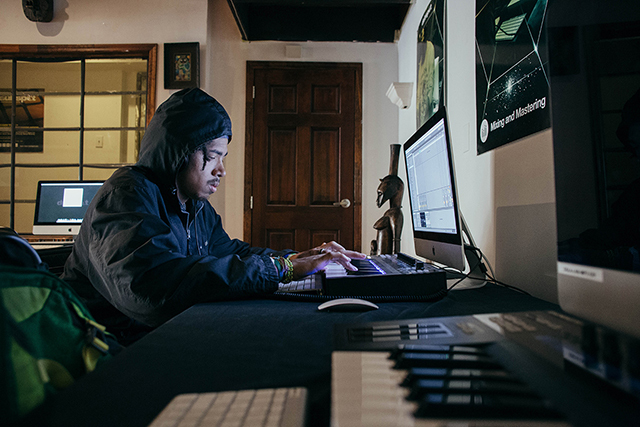 Multi-talented musician, Mark de Clive-Lowe shows use his approach to building melodies and musical structures around chord progressions using Native Instruments’ Maschine. 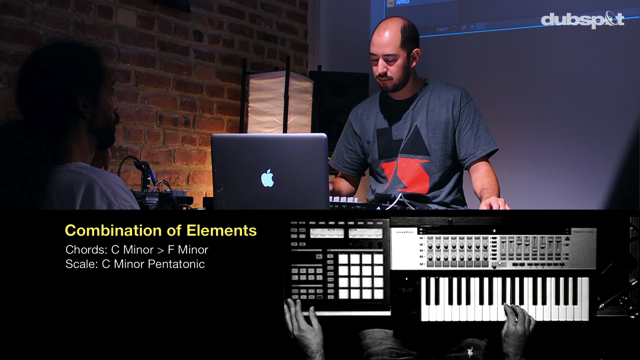 In this special masterclass, guest instructor and multi-national phenom Mark de Clive-Lowe demonstrates different improvisational approaches to building melodies and musical structures around two chord progressions using Native Instruments’ Maschine. The students present in the video are part of Dubspot’s three level Music Foundations Program currently available at our schools in New York City, Los Angeles, and Online. Did you know that there are three distinct types of musicians in today’s global music scene? These types of musicians direct their attention to different aspects of the compositional process: one is focused primarily on pitch/melody, another on rhythm/beats, and the last on timbre/sound design. Today, the well-rounded musician will be well versed in all three of these areas, and that is the main idea behind Dubspot’s Music Foundations Program. Using material from Music Foundations Level 2: Keys and Melodic Theory, Mark de Clive-Lowe focuses on pitch and melody while demonstrating how to use a set of pitches to improvise over a two-chord progression, namely the Pentatonic scale (a common five note scale). The progression goes from a C Minor chord to an F Minor chord, which fits nicely underneath the C Minor Pentatonic scale. With the addition of some tension filled note choices, such as the #4/b5 “blue note,” Mark quickly creates some melodic variations. By the end of this video, we see all of the elements put together in two musical examples in different genres and at different tempi. This is a small taste of what you will learn in the Music Foundations program at Dubspot. Be sure to check out other music theory related articles here. MARK de CLIVE-LOWE (MdCL) is one of the most innovative producers and live performers you will find anywhere – equal parts jazz musician, electronica artist, and DJ. Anchored by the duality of his Japanese and New Zealander parentage and ignited by a love of playing piano at the age of four, it is no wonder this multi-national phenom has seen his explosive natural gifts blaze across the globe from NZ to the US, UK, Europe, Asia, Cuba and South Africa. Whether you call him an artist, producer, composer, pianist, performer, DJ, or selecta, titles are impartial to Mark de Clive-Lowe (MdCL). Many try to classify this impressively fertile music journey, yet to identify with only one label belies the heavy scope of the ride. The piano set the course; the keyboard is the vehicle, and with the drum machine as the fuel, the relentless skill of MdCL is underscored by a rare sonic sensibility. He’s an accomplished musician, originally sowing his oats in straight-ahead jazz, before taking the music far beyond. A devastating live performer, the MdCL experience is marked by impromptu studio production created on stage from scratch, using drum machines, keyboards, and effects. The end result: live remixes birthed on stage for each and every gig. With bold chops like this, to call him “prolific” is an understatement, having contributed to over 250 releases and being a first-call collaborator for a wide range of artists, including Jill Scott, Jody Watley, Leon Ware (Marvin Gaye/Michael Jackson/Maxwell), DJ Spinna, Sandra St. Victor (The Family Stand/Chaka Khan), amongst a slew of others. Based in LA for the past seven years after a decade entrenched in the cultural epicenter of London’s broken beat scene, MdCL leads his live band with his party CHURCH performs solo live electronic sets for the dancefloor, educates with masterclasses and workshops, and collaborates with a broad range of artists and creatives. Melding the beat-making and technology with musicianship and tradition, MdCL’s potential is beyond convention. He’s one who takes it all on the road like no one else, with a solid fan base that bridges cities as far reaching as LA, NYC, Atlanta, London, Paris, Amsterdam, Barcelona, Tokyo, and Sydney. The post Music Foundations Tutorial: Chord Progressions w/ Mark de Clive-Lowe appeared first on Dubspot Blog. At Point Blank we regularly raid our contacts book to invite established names to take part in guest artist masterclasses. Featuring a diverse selection of artists from across the electronic music spectrum, these sessions not only give a revealing insight into the creative processes of successful musicians but also provide a great opportunity to mine insider industry knowledge. What follows is a round-up of recent guest masterclasses we’ve hosted, from track deconstructions to in-depth interviews, both here at the school and elsewhere under the Point Blank banner. Now kick back, press play and learn a thing or two. And remember, if you want to be the first to catch these interviews and live events make sure you subscribe to our YouTube channel. Of course, if you can envision yourself doing your own guest masterclass one day, the best first step would be studying us at Point Blank. Throughout June, we’re offering a 10% discount off all London BA (Hons) degree and diploma courses, so there’s no better time to start your journey. To get your discount, just go to the enrolment page of your chosen course and enter PB10. Roger Sanchez is one of the most influential house producers ever. That may be a bold claim but it’s one supported by his array of high profile remixes, influential productions and famed DJ sets. From winning a Grammy for his remix of No Doubt to chart success with his number one single ‘Another Chance’ not only has the S-Man conquered the global music scene, he’s also smashed the underground with his array of aliases and styles. We invited him to Point Blank London to quiz him on a broad catalogue of subjects, including his approach to DJing, production, technology and his new compilation for Defected: Strictly Roger Sanchez. As Solomon Grey, London-based Tom Kingston and Joe Wilson mix acoustic instruments with electronics and sound design, creating a sonic calling card that’s both organic and synthetic in equal measure. Unsurprisingly, their soaring, widescreen sound was tapped by the BBC as the soundtrack for their The Casual Vacancy adaptation, but with Solomon Grey music also finding a home on labels as diverse as from Black Butter Records and Anjunadeep, you never quite know where they’re headed next. Here they break down their track ‘Broken Light’ in a Track Masterclass spot. US-born, Leipzig-based house producer Lane 8 is one of the rising stars of the Anjunadeep label. Walking the line between chill, home listening and emotive club banger, the man born Daniel Goldstein has earned support from the industry’s great and good – not least Pete Tong who singled him out as a future star. We invited him to deconstruct his track “Undercover”, taken from his debut album Rise. Swedish duo Alexander Björklund and Sebastian Furrer have been making music under their Cazzette monika since 2011, breaking through a year later with the massive club smash “Beam Me Up”. Known the world over for their powerful and punchy EDM productions, we invited them to the PB studio to talk us through the aptly titled “A State of Bliss” using FL Studio. Hannah V has done a lot in her short career. As well as working with seminal production squad Bugz In The Attic to touring the world with artists like Rihanna, Jessie J, Sugababes, Jason Derulo and many more, she’s managed to find time to kick start her solo career in impressive fashion. With her new track ‘It Ain’t Right’ already making waves, we decided to pay her London studio a visit to find out more about her background, her creative process and how she put the track together using Logic Pro X.
Flux Pavilion’s expert sound design and composition skills quickly turned him in to one of the biggest acts in modern dance music. While still living in student halls, his track ‘I Can’t Stop’ was given Radio 1’s acclaimed ‘Hottest Record in the World’ label, pushing him even further into the mainstream. He’s since produced for The Prodigy, Major Lazor and Example as well as remixing DJ Fresh, Skrillex and many more. Of course we had to head to his studio to find out how he does it. For the past 20 years, DJ Yoda has been defining and re-defining DJ and mash-up culture, combining styles and genres across decades and continents. We asked him to join us for a masterclass at 2015’s inaugural Take Note – a brand new educational conference for the music industry. He shows us how he uses Serato and Pioneer’s DJM-S9 mixer for his AV show as well as talking about his DJ history and how he sees DJ technology evolving. Stefano Ritteri is a DJ, label owner and Point Blank instructor who has released music on some of the leading house labels in the world, including Defected and Dirtybird. When Point Blank was asked to host the second room at Take Note, we of course invited Stefano. Here he discusses his background and his approach to remixing in Ableton Live, taking a deep dive into Christian Nielsen’s Beatport chart-topper ‘Do You Mind’. If you want to benefit from Point Blank’s exemplary network of connections, learn from industry professionals and kick start your own career in the music industry, you should join us. Our BA (Hons) Music Production & Sound Engineering degree is the pinnacle of what we offer and gives you a 360-degree view of your options in the industry. Our courses are developed by professionals who have worked with Pharrell Williams, Chemical Brothers, Swedish House Mafia and Massive Attack and modules cover music composition, DJing, live sound engineering, music business and much more. Validated by Middlesex University, you won’t find a better way to immerse yourself in your passion for music. Find out more about our BA (Hons) Music Production & Sound Engineering degree here. The post Point Blank Guest Artists Recap appeared first on Point Blank’s Online Magazine. 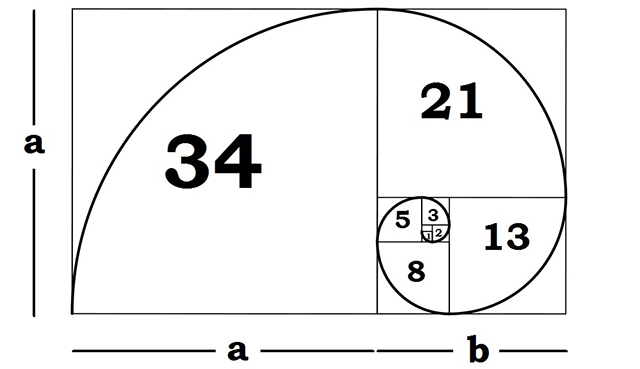 Dubspot’s Rory PQ explores the relationship between the Fibonacci Sequence and the Golden Mean in music. 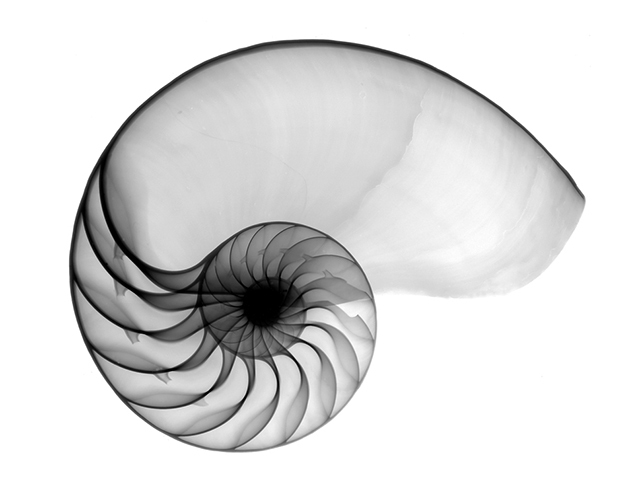 The Fibonacci Sequence and the Golden Mean reveal an extraordinary phenomenon that occurs throughout nature, art, music, and mathematics. Also known as the Golden Ratio or Golden Section, the Golden Mean is a mathematical ratio that artists, architects, and musicians have used to craft their art form for centuries. The Fibonacci Sequence is a series of numbers that exhibits a fascinating numerical pattern that was originally discovered by Leonardo Pisano Bigollo. Famously known as Fibonacci, Leonardo was a 13th-century Italian mathematician that popularized the Hindu–Arabic number system in the Western World and introduced Europe to the sequence of Fibonacci numbers. The relationship between the Fibonacci Sequence and the Golden Ratio occurs when you take any two adjacent numbers and divide the smaller number into the larger number, which results in a number close to 1.618. The further along the sequence you go, the resulting division of the small number into the next larger number gets closer and closer to 1.618. That number is commonly symbolized by the Greek letter “Phi” or otherwise known as the Golden Mean. 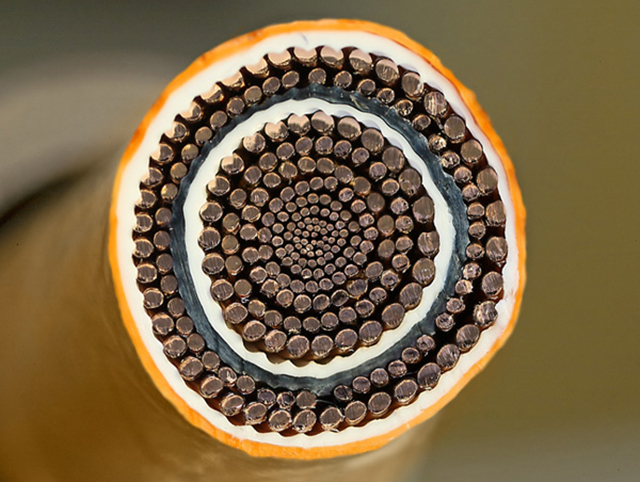 You’re probably asking yourself, what the heck does this have to do with music? Well, the ratio 1.618, has been used by architects, artists, and musicians as a way to structure their artistic creations. For example, the Golden Mean is found in the length and height of the Great Pyramid of Giza. Leonardo Da Vinci called the Golden Mean “Divine Proportion” and featured it in many of his paintings. In his famous “Last Supper” painting he used it to define the dimensions of the table to the proportions of the walls and windows in the backgrounds to achieve balance and beauty. In music, the Golden Mean can be found in many compositions mainly because it is a “natural” way of dealing with divisions of time. Legendary composer Bela Bartok used the Golden Mean to structure one of the best-known compositions “Music for Strings, Percussion and Celesta,” so that musically important events occurred in bar numbers represented by the Fibonacci Sequence of numbers. Now that we have a general understanding about the Fibonacci Sequence let’s explore how it influences music and instrument design. Numbers in the Fibonacci sequence can be seen on a piano keyboard and in the musical scales. For example, scales along a piano keyboard are composed of thirteen keys in the span of a full octave which consists of eight white keys and five black keys that are arranged in groups of two and three along the keyboard. Fibonacci numbers are also present in the notes that make up musical scales. For example, the Pentatonic scale has five notes, the Diatonic scale has eight notes, and the Chromatic scale has thirteen notes. In addition, the 1st, 3rd, and 5th notes in any scale create the basic foundation of chords. Do you see the pattern? There are even more relationships, but we don’t want to go to deep. Sylvain Lalonde demonstrates the relationship between music harmony and the Fibonacci Sequence further in this video. The most pleasing combination of frequencies are those having simple ratios of harmonics that derive musical intervals. Going down the rabbit hole further, we can even associate the Fibonacci numbers and the Golden Mean with note frequencies. Notes in the Chromatic and Diatonic scales are based on natural harmonies that are created by ratios of frequencies. Looking at the chart below, you can see that the first seven numbers of the Fibonacci Sequence (0, 1, 1, 2, 3, 5, 8) are related to key frequency ratios. Let’s talk about harmonics before going all Fibonacci. Harmonics are a series of frequencies that are multiples of a fundamental frequency. A pure note consisting entirely of one frequency will sound boring. This series of related frequency combinations sound the most pleasing because there are multiple overtones that work together to make a sound more interesting than a pure note consisting entirely of one frequency. For example, let’s use A3 as our fundamental frequency. 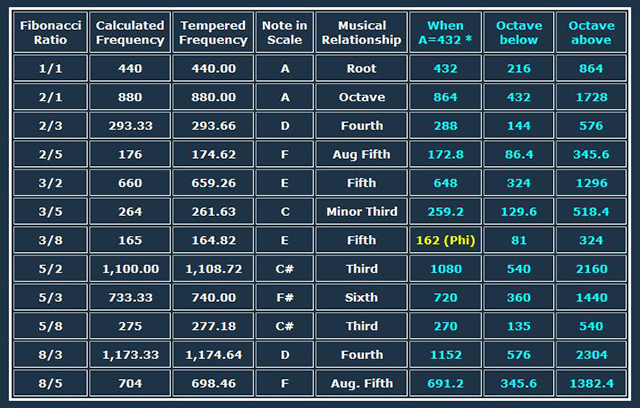 The note frequency for A3 is 440 Hz. The second harmonic will be twice this frequency. If we double 440 Hz to find the next harmonic frequency, we get 880 Hz, which is the note frequency for A4. The third harmonic will be three times the fundamental frequency. In this example, the third harmonic is 1,320 Hz, which is the note frequency for E5. The third harmonic is a perfect fifth above the second harmonic because the E is seven semitones above the fundamental note and includes the first five notes from the major and natural minor scales. Hope you’re still with me! The Fibonacci numbers relate to ratios of harmonic frequencies because a root note has a ratio of 1/1, its octave has a ratio of 2/1, a fifth above it has a ratio of 3/2 and so on for the other notes in the scale. These simple ratios of harmonics all contain numbers found in the Fibonacci sequence. Relationships between Fibonacci numbers and the Golden Mean are frequently found when analyzing the structure of compositions and musical patterns dating back several centuries. For example, the climax of many songs or even an important measure where the song changes significantly such as the bridge often occurs near the songs Phi point. As we mentioned earlier, Phi is the basis for the Golden Ratio, Section or Mean. Considerable evidence suggests famous composers such as Mozart, Beethoven, Bella Bartok, and many others have used Fibonacci numbers and the Golden Mean to compose measures of music and structure their compositions. The Phi point can be determined by taking the number of measures of a song and multiplying them by 0.618. More often than not the result will mark the beginning of a measure where a significant change occurs. I tested this theory on Disclosure’s hit song “Latch.” Using Ableton Live, I determined the song is roughly 129 measures long. I then multiplied 129 by 0.618 and got approximately 80. Sure enough, measure 80 marked the beginning of a tension building bridge that occurs before the final drop. Hear for yourself; measure 80 starts around 2:37. At 2:36 the same tension building bridge begins that we explored earlier. Very interesting! The following video demonstrates this theory further. Violins crafted by the master luthier Antonio Stradivari are famously known for their exquisite tonal quality and aesthetic form. Genuine Stradivarius violins are highly sought after and are the most valuable instruments in the string-playing world because of their unmatched sound. However, what is most amazing about his violins was that they were designed and build around the Golden Ratio. 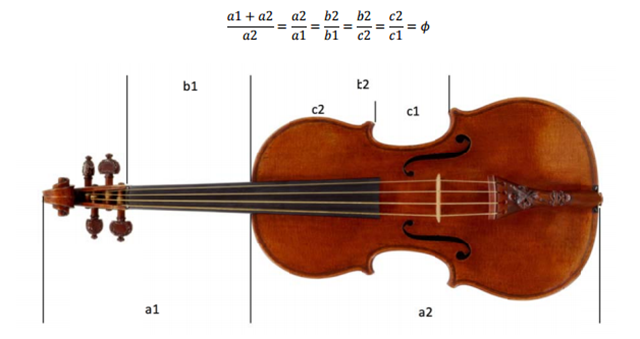 The proportions of the violin conform to the ratios of Phi. Even the spiral of a violin scroll reveals how precisely his instruments reflect the Golden Ratio. 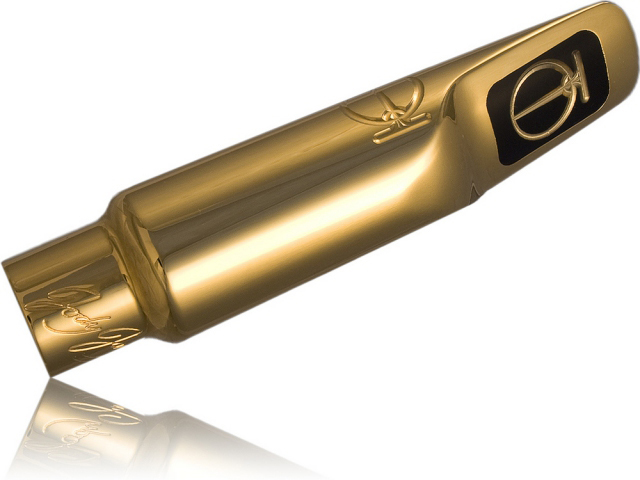 Jody Espina, a highly regarded jazz musician and designer of Jody Jazz Saxophone and Clarinet Mouthpieces has applied Phi in the design of his premier saxophone mouthpiece, the JodyJazz DV. “An infinitely indivisible progression known as the Fibonacci sequence or Golden Section is the key to resonance control. The ratio of Phi, or 1 to 1.6180339887…to infinity, is the Golden Mean, called Golden Ratio or Golden Proportion. While exploring the relationships between music and the Fibonacci Sequence, I discovered several other fascinating findings linking the numbers to all types of things. If you found this exploration interesting, I encourage you all to investigate this amazing phenomenon further. The post Music and the Fibonacci Sequence w/ Rory PQ appeared first on Dubspot Blog. It’s not just the almost endless modulation options that made Massive one of the most popular soft synths of all time – its hugely varied oscillator options made its sound even more flexible. In fact, using Wave Table technology, oscillators could be morphed and transformed into something completely new. That’s the focus of our second video in a new series looking at Sound Design in Massive. PB instructor Chris Carter explains how Wave Tables work and how to modulate them in Massive – you can watch the video above and make sure you subscribe to our YouTube channel for more free tutorials and live events. The post NI Massive: Synthesis & Sound Design Pt 2 – Wave Tables in Massive appeared first on Point Blank’s Online Magazine.